Living legends, comeback stories, shimmery dream pop, good old Americana and rising pop stars. This week we’ve got a little bit of everything in store for you. If you know anything about me, you probably realize that I’m a fan of Damon Albarn. During my sets on Turntable.fm in Indie While You Work, I’d often sneakily play four Damon Albarn songs without sounding repetitious. Luckily, I could do this with Damon Albarn as each of his projects has a unique sound. That is, one can tell the difference between a song from Blur, Rocket Juice and The Moon, Gorillaz, and The Good, The Bad, & The Queen. 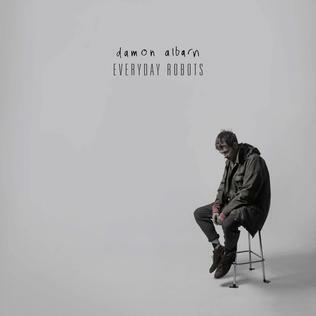 The same can be said of Damon’s first “official” solo album – Everyday Robots. Everyday Robots is a somewhat strange album as it is an album of contrasts. For the most part, the underlying melodic theme throughout the album is consistent, though a contrast within itself: a mixture of the old and the new. Tracks like “Everyday Robots” and “Lonely Press Play” are especially characteristic of this. In both tracks you get a somewhat sad, yet cautiously optimistic minor-chord piano progression accompanied by an electronic drum machine track. On most tracks, you’ll hear the raw analog feeling associated with instruments that need to be transitioned into the digital – whether it be a piano, brass, or string instrument. However, the percussions are almost exclusively digital. Lastly, this album is both brief and enduring. Two tracks clock in at a minute or less. These short snippets don’t necessary represent a transition in the album. They are more like amuse-bouches – a nice little delicious surprise thrown in by the artist. Contrastingly, “You & Me’ takes up around 15% of the entire album’s run time and really feels like the center holding two opposite ends of Everyday Robots together. Certain things are inevitable. One can basically write it in stone that on an annual basis an impossibly young pop star will emerge from the island of Great Britain and take over the UK charts with a soulful voice beyond his or her years. Frequently, that artist will rightfully gain a following across the Atlantic as well. Adele, Craig David, Amy Winehouse, and now, Sam Smith. And yet for every British crooner who makes it to the Billboard Hot 100, there are others who don’t quite make the transatlantic jump. 22-year old John Newman released his debut album in the UK last year and has enjoyed immense success in the British charts with an appearance at #1 on the singles and album charts. Like Sam Smith, Newman capitalized on an appearance on a wildly successful British dance act’s album (Rudimental’s “Feel The Love” went to #1 in 2012). Unlike Smith, however, Newman hasn’t seen as much success on this side of the pond. I saw this album was getting a lot of buzz lately, and picked it up on a whim on vinyl last week at a record store going out of business sale. Rarely do I buy an album without previewing it first, but really, $11 is not gonna break me, and I’m glad I took the plunge on this one. Astoundingly, this is only Perhacs’ second album — the first coming out 44 years ago. You can read about her roundabout music career elsewhere, and it’s a nice comeback story for the 70 year old dental hygienist. This week I wasn’t really in the mood to listen to full albums. Instead I wanted to listen to single songs by as many artists as possible. I have heard some really fantastic stuff and I started making a playlist of my favourites for May. It already has about 70 songs on it and since my monthly playlists usually only have about 25 songs on them, this is either a sign that I hit the jackpot and found a lot of really great music, or I’m not being picky enough. One of the artists that stood out for me was a London four piece band called Woman’s Hour. Their sound could probably best be described as atmospheric, minimalistic, dream pop with memorable melodies and soaring vocals. So far they have only released a series of singles, but their debut album Conversations will be out on July 15th.